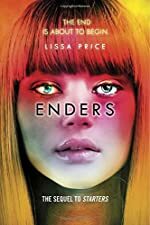 Enders by Lissa Price. The Sequel to Starters. Review: Enders. In Lissa Price's sci-fi action packed book, she teleports you into future America where the world is not what it seem. This phenomenal book will grab attention of lovers of Divergent and fans The Giver. In Enders you will witness the amazing actions that Callie Woodland makes to find out the answers to all her questions. Callie Woodland just a few months ago destroyed Prime Destination This is where they held donors to be rented out by seniors. Because of the body blank discontinued Callie freed starters and non-starters. But now, Callie is on a mission uncover the identity of the Old Man. Since he can come into her mind and manipulate her body, she has a strong desire to take out the voice out of her head. After witnessing a death of a Metal by the use of mind control. She now has an even stronger desire to take the Old Man out. She is on an assignment for the Old Man she is kidnapped by another starter. While on the journey, she is finds about her father that he isn't really dead from spores but he is really on an assignment to plan the corrupt use of Metals. While not only having found out secrets from her father, but also from someone she thought she could trust. Can she trust Hyden? Or will he lead her straight to doom? Find out in Enders. This is a spectacular book. There are many reasons to love this amazing sequel. First off, the plot is intriguing; this story will keep you on your toes the entire time. This book is not rushed, but very well paced this book is easy to comprehend compared to other science fiction books. The plot is not only creative, but also intelligent. Second, the way she defines Callie's character will have you wishing to be Callie. With her strength, determination, and skill, every girl will wish to be Callie. As you read you can see that Callie's fierceness and her determination for what she wants. After reading this phenomenal novel this will leave you at the edge of your seat until the very end! We would like to thank Random House for providing a copy of Enders for this review. Have you read Enders? How would you rate it?